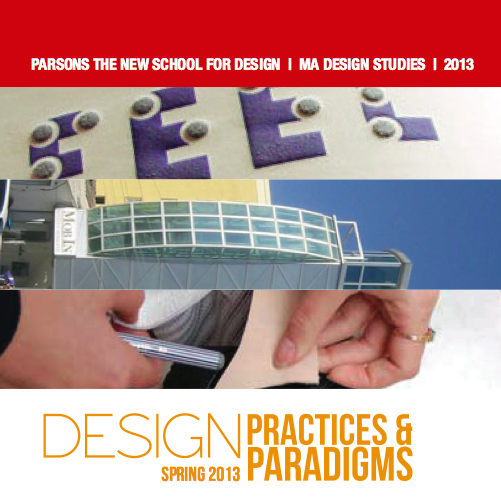 Associate Professor Susan Yelavich, Director of the MA Design Studies program, taught a new course entitled Design Practices & Paradigms in the Spring 2013 semester. The inaugural MA Design Studies cohort put together a booklet featuring three case studies as a prototype for an extended publication of research on the changing nature of design practice. What does the scope, structure and content of practice reveal about the state of design and the ambitions of design today? What does it mean to run an architecture practice that is inspired by the ways people build their homes and cities during times of extreme political crisis? How does a media designer transform his studio into a research-led enterprise that focuses on the needs of diverse communities around the world? What does it mean to make people fashion-able vs. fashionable? In this course, students studied a particular designer’s approach to production, collaboration, and authorship as well as the social and intellectual context that shaped the designer’s projects and values. Students were provided with readings about various modes and philosophies of design today. They did independent research, conducted interviews, and produced concept maps of their designer’s process and practice. The semester culminated in the production of a research paper that offered a critical perspective on the contributions, values, and questions raised by the modes of practice they studied.